Cleaning your hands with ProShield Foaming Hand Soap not only helps eradicate odors, but also provides a lasting, fresh scent that will uplift the mind. 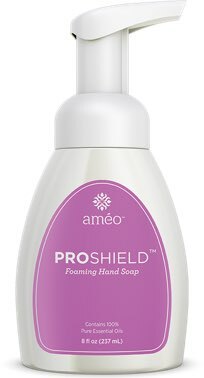 With Améo Essential Oils like Clove, Cinnamon, Lemongrass, Orange, Lemon, Rosemary and Eucalyptus Radiata, ProShield Foaming Hand Soap has a sizeable amount of beneficial properties. The valuable ingredients in Améo Whitening Toothpaste are expertly combined to create a creamy, minty and effective product that reveals your brightest smile. With added Améo Essential Oils like Spearmint, Tea Tree, Myrrh, Lemongrass and Clove, you can experience a clean mouth and lasting fresh breath in a more natural way. GenM Fresh Citrus Shampoo gently cleans away dirt, oil, sweat, buildup and other pollutants with a burst of natural Lemon, Bergamot and Orange essential oils. The sulfate-free, paraben-free, Moringa-infused formula is also naturally scented and colored. You’ll be left with clean, manageable hair that looks, feels and smells amazing. For best results, follow with GenM Fresh Citrus Conditioner. GenM Fresh Citrus Conditioner softens, moisturizes and nourishes, allowing dry, brittle hair to be rejuvenated, healthier and more manageable. The sulfate-free, paraben-free, Moringa and Améo Essential Oil-infused formula is naturally scented and colored. Replenish your hair with the vitamins and minerals needed to maintain a luminous shine.